How is your testimony if I may ask? Am not talking about the little platitudes that most of us have recited over the course of time, since our Sunday school days, and rarely come from a deep conviction – “Praise God, am so and so, am saved”, bla bla bla. On the contrary, it is good. It is very good to talk out your testimony, after all, even in mockery, in jest or in not so serious terms, Christ is still preached– Philippians 1:18. That aside, am talking about your testimony. What do people see about you? What do you say when a “hot guy” asks you out? What do you do when a pretty lady struts before you? Or have an uncensored message forwarded to you? What do you you come across a sexualized post? What do people talk about when they hear about you? 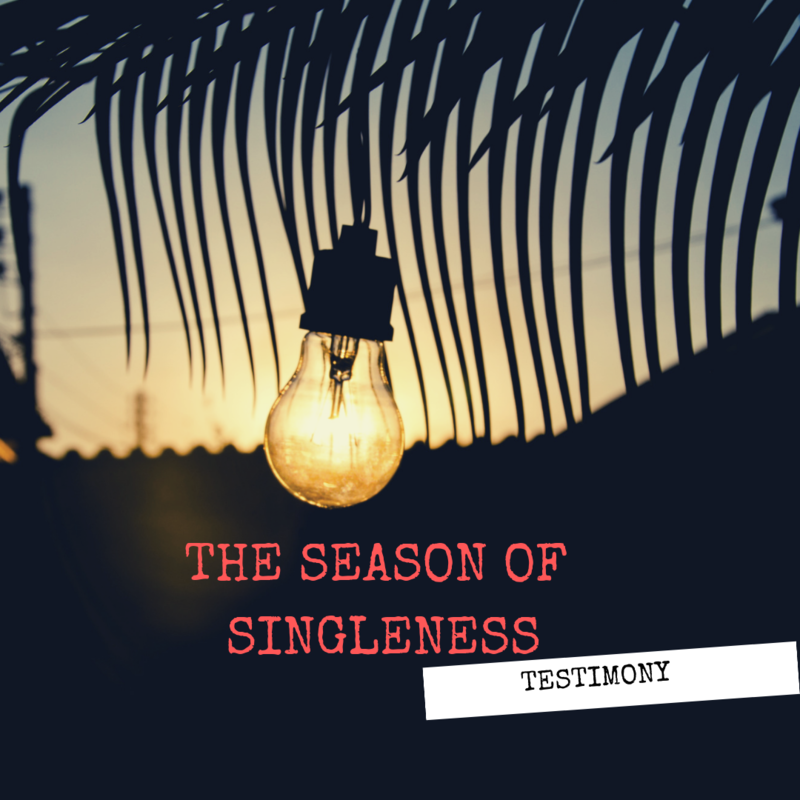 How is your testimony in this season of singleness? Do you live a double life? Or do people know you for your unbridled testimony about the saving grace of our Lord? Peter’s accent gave him away as a follower of Christ, yet for the fear of being persecuted, he denied the only savior he proclaimed. “I do not know this man”, he said, throwing curses at everyone who seemed to implicate him as a follower of Christ. Three times he denied Christ. Three times he pushed his salvation away. Three times he saved himself, pursued himself, covered himself – yet, he had walked with Christ. His aide de camp – remember how he chopped off an ear? I was born again, but really conformed. My heart was always in antagonism with my spirit, squashing the Holy Spirit’s conviction in most of my life’s decisions. My dating life was one of them. I pursued romance with every bit of me. Outpouring myself to it more than my God, needing it for validation and acceptance. I knew my pathology, but I longed for control more. Doesn’t pursuing a relationship that is clearly not in God’s obedience seem more of a pride issue? Absolutely! The breakups were hard, but I quickly jumped onto another relationship, to cure that fragile part of me. All along, the problem wasn’t God’s time, it was mine – Christ was fizzling out, and relationships became my drug of choice. It was my kind of high, my addiction. In the midst of all the clamor, I remembered my lamp. The lamp that I had kept under my clay pot and hid under my bed. That time came, when I decided to put my lamp back on the table. I was not called to be normal, I was called to be the abnormal – moving parallel against the tidal waves of the world. As smoldering as the wick looked, as fizzled as it appeared, it was time for it to get back to its rightful place. Jesus said, Luke 8:16, No one lights a lamp and covers it with a jar or puts it under a bed. Instead, he sets it on a lampstand, so those who enter can see the light. Are we different from Peter, especially when in the season of singleness? We might be too quick to point at Peter’s wrongdoings, but no, we are not any different. Most of us do not profess out our salvation boldly. We do not want to be termed too spiritual, lest we lose out on friends, we hide our salvation, lest we don’t get a clique, we blot our redemptive status not to miss out on our “latest catch”. Our lamps are put under the bed– because we are too afraid to be labeled like Peter. But what happens when our lamps are under the table? When we cannot live our lives out for Christ? There in that moment, the enemy finds a loophole to exploit. Genesis 4:7- But if you do not do what is right, sin is crouching at the door. Its desire is for you, but you must rule over it. When we cannot live our lives out boldly for Christ, we risk living our lives out loud in aggravation. Have you seen how many take to social media disgruntled about who they are dating? What he/she did and how they left them broken and scathed? All those aching souls need more than a flood of Christ’s love. We are too good at pulling out little saved acts, leaving the Pastors, elders, deacons and full-time ministers to read the word for us, win souls to Christ for us, then find some free time on Saturday afternoon, when bored and jaded, to “do some little service for Christ”, but cannot loudly proclaim Christ. How many more write, “am all about Jesus” on the Facebook biography, but their fruits show parallel acts? How many of us proclaim Christ in our circle of friends away from church and bible study fellowships? How many can say “I am not ashamed of the gospel of Christ?” without getting uncomfortable? Conformity at its best. The bible says that they overcame him by the blood of the lamb and the word of their testimony. Revelations 12:11. “But do I need to keep saying am saved?” Oh yes you should! After all isn’t Christ your identity? The bible says that when we BELIEVE and CONFESS that Jesus is Lord then we are born again. We overcome the enemy not only by the blood of the lamb, but by the word of our testimony. The devil is so conniving, telling us not to proclaim Christ out loud, “it’s really unconventional” – he says, yet he is boldly and baldly parading billboard promoting all kinds of vices. The media falls nothing short of highly sexualized advertisements. We have little gods in form of high ranked personalities who speak to the lives of the young about – “living a high end lifestyle”, “how to attract a hot guy” – in subtle yet powerful ways – but we are quietly folding our arms. Are we really soldiers in the army of the Lord if we are going to muzzle our testimony? Are you really a soldier of the Lord if you cannot speak about God in your relationship and what position Christ holds in your life? Are you really a soldier in the army of the Lord if your feelings take precedence before your obedience to Christ? Every single person was created by God to show God. To display God, His essence, His awesomeness, His power, His wondrous deeds, His greatness and His love. But what happens if we take our eyes off Christ and let our eyes wander from His glory and our hearts grow fonder towards tiny gods? Yes, the little gods we make, our independence, careers, children, relationships and even marriage? What happens when we fix our eyes on getting our self-satisfaction from relationships – most of them never leading us to Christ – and bench our testimony? We fall. We lose our faith. We stifle our growth, eventually we die. Christ came to save us from the very same things we run towards, relationships that make us lose our testimony. Every opportunity that God grants you to interact with someone should leave them saying, “I want to know your Christ.” We are saved to be commissioned to this fallen world. Not to keep quiet, but to make disciples of Christ, through our interaction with people. “Do you want us to talk about Christ, every single minute” Why not? To be very certain about this, am talking about the moments after sure glances, and a hello, what do you say next? Don’t let your conversations escalate on without letting someone know on whose network you get your signals from. If its Christ, let it be known, let it be seen! Do not be ashamed of Christ in this season of singleness! What would benefit you if you get the whole world, get a million plus likes, a million plus followers, but forfeit your soul? Matthew 16:26. In Christ, there is satisfaction. The more He occupies your soul, the more you will long for Him in every area of your life – your relationship included. Glad to have my lamp on the table! Let it be known that Christ is the only one for me!